We’re all familiar with the thought that it’s a fashion faux pas to wear white after Labor Day. While we’re not fashion experts, at my dental office in Madison, we tend to disagree with this rule. Here, white smiles are always in style and we’ve got some tips on how you can get yours brighter and keep it that way. Whether it’s because of what you drink, habits you have, or time itself, there are plenty of things that can make your white smile fade and become dull. The good news is that it’s easily fixed by whitening. There are many options available to help you get a whiter smile, but your best choice is by going to your Madison dentist for a professional whitening. Not only are the trays that are used custom-fit to you, which means no solution gets on your gums and causes damage, the solution itself is stronger than the kind you can find in the drugstore. 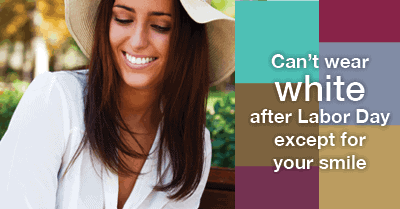 Additionally, your dentist can help you get your ideal shade of white without over-bleaching. Once your professional whitening is completed, there are several things you can do to help keep your smile in just-whitened condition. We all know that sugar is bad for your teeth as it increases your risk of tooth decay. But what some may not know is that decay can discolor your teeth and make them appear dull and dingy. In order to keep your smile white, eat less of the sticky, sweet foods and more of the crunchy vegetables. It’s also important to know which foods can contribute to staining and to avoid those as much as you can. Berries, coffee, tea, wine, and tomato sauce can all cause your smile to fade, so eat them in moderation. If you have to enjoy a soda or coffee, try drinking it with a straw as it helps keep the staining agents away from the surfaces of your teeth. Tobacco not only causes some scary health problems, it can also cause yellowing of teeth, not to mention serious oral health problems like gum disease and oral cancer. Whether it’s chewed or smoked, tobacco is just not good for any part of your body. It’s better for your smile, and your overall health, if you just don’t do it. You should already be brushing twice a day and flossing once, but if you’re striving to keep your smile white, it’s really important that you continue to do so. Brushing and flossing helps remove plaque which can actually cause stains to linger around and get stuck on the teeth. By keeping up with your appointments to my Madison dental office, you can make sure your smile is healthy overall… and a healthy smile often means a white smile. At these appointments, we can also check in on how your whitening is holding up and see if you may need a little touch up. If you follow the tips above, touch ups should be minimal and your smile can keep on shining.